Designed for all conditions, the new CobraMarine JumPack keeps you going on the water or off-road. Miami, FL (February 15, 2018) — Cobra Electronics, the leading designer and marketer of award-winning automotive, mobile and consumer electronics, today announced the availability of the new CobraMarine® JumPack XL H2O. Designed to jump start most inboard and outboard boat engines, the new JumPack XL H2O is UL certified and will keep you going on the water and on the road. The rugged and waterproof design makes this the perfect portable power device for any watercraft, off-road vehicle, car, SUV or truck. The CobraMarine JumPack XL H2O will be on display in the El Capitan Booth #D-135, the Crook & Crook Booth #D-360 and the Hopkins Carter Booth #D-208 at the Miami International Boat Show, February 15–19, 2018. 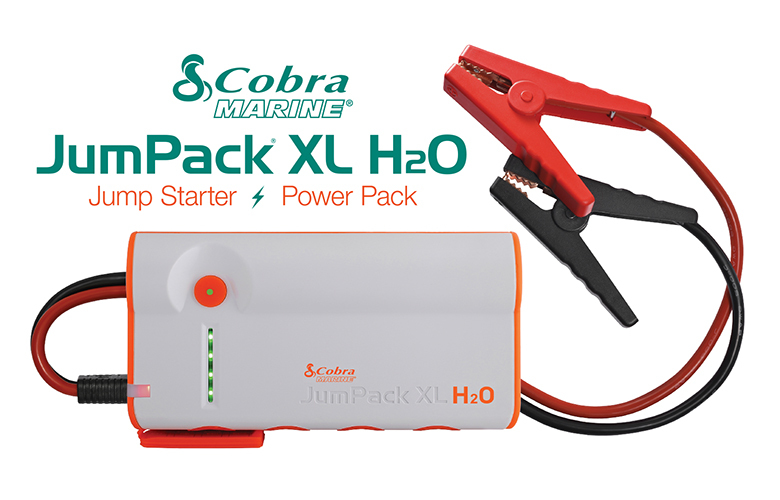 The new CobraMarine JumPack XL H2O also features two ways to jumpstart your engine, one using the included jumper cables and a secondary option allowing charging and starting through the 12-volt port for a simple, non-intimidating jump start. 400 Amp Starting Current, 600 Amp Peak Current | The CobraMarine JumPack XL H2O jump starts most gasoline and diesel engines as well as cars, trucks and off-road vehicles in all weather conditions. Charge Multiple Devices | This compact UL 2743 certified portable power pack contains a powerful 44.4Wh (12,000mAh) battery with dual 3 Amp USB outputs to rapidly charge two portable devices simultaneously, making it the ideal emergency battery pack for home, office, vehicle or the outdoors. Easy-to-Read LED Status Light | The CobraMarine JumPack XL H2O features advanced internal protection circuitry with a visible tri-color jump start status LED that illuminates; Green when the JumPack H2O is safe to jump start; Flashing Yellow indicates wait; and Red indicates that a problem has been detectected. Emergency Flashlight | The CobraMarine JumPack XL H2O features a built-in high-intensity flashlight with SOS and Strobe functions for emergencies. The CobraMarine JumPack includes heavy duty jumper cables and two different charging methods; a 12V DC charger to re-charge while underway, a 120V AC wall charger to re-charge when ashore and a neoprene case to keep everything together. The Cobra Marine JumPack XL H2O is available now for pre-order at the Miami Boat Shows in the El Capitan, Crook & Crook Marine and Hopkins Carter booths for $169.95. It will also be available at your local marine retailer, Overton’s, Boat Owners Warehouse, Hamilton Marine and Fisheries Supply by the end of February.